At Clin d’oeil films we are committed to cinema with a social and/or political statement. That’s why we are so honoured that our new film ‘By the Name of Tania‘, written and directed by Mary Jiménez and Bénédicte Liénard has been nominated for the Amnesty International Film Award. Last week the film was also nominated for the Glashütte Documentary Award. Congratulations to both directors, to the team and all our partners! After a very successful premiere and great press reviews we are happy to announce ‘Manu’ will be screened at different venues in Wallonia as well as in Flanders. Take a look at the website of the film to find out when it’s screened near you. You don’t want to miss out on this one! Great news from Romania: ‘Samuel in the Clouds’ has been officially selected for the International Competition at the Alpin Film Festival in Romania! This festival takes place from February the 27th until March 4th 2018 in Predeal, Bușteni and Brașov. ‘Samuel in the Clouds’ will be screened on March the 2nd at 07:00 pm in Brașov. 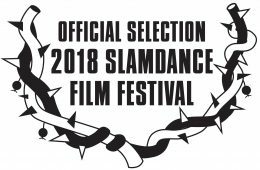 We are very excited to announce that ‘Sunnyside’, the debut film of Frederik Carbon, has been selected as one of the eight documentary features in competition at Slamdance Film Festival 2018. The 24th edition of this annual festival will take place from the 19th of January until the 25th of January 2018 in Park City, Utah, US. This will be the film’s international premiere! http://www.clindoeilfilms.be/wp-content/uploads/2017/11/slamdance18-copy-laurelsoffsel-e1513681294110.jpg 220 337 clindoeil http://www.clindoeilfilms.be/wp-content/uploads/2013/07/bird.png clindoeil2017-11-29 10:51:382017-12-19 11:02:02'Sunnyside' selected for Slamdance! We are very excited to announce that ‘Sunnyside’, the debut film of director Frederik Carbon, will have its Belgian premiere at Filmer à Tout Prix in Brussels on November 25th! The film will be screened at 06:45 pm in the ‘Belgian Panorama’ section and the director will be present for a Q&A after the screening. We are very excited that ‘Samuel in the Clouds’ has been selected for yet another great mountainfilm festival: the International Mountainfilm Festival Graz, Austria. The film will compete in the category ‘Nature and Environment’. The screening will take place on Wednesday November 15th at 05:00 pm. Wonderful news from the mountains in Alberta, Canada: ‘Samuel in the Clouds’ has been officially selected for the film competition at North America’s largest mountain festival, the BANFF Mountain Film & Book Festival! The festival will take place from October 28th until November 5th 2017 and ‘Samuel in the Clouds’ will have its Alberta premiere on November 3rd at 07:30pm. At the 13th Mountain Film Festival in Zakopane, Poland, ‘Samuel in the Clouds’ has received the wonderful Youth Jury Prize in the International Mountain Film Competition yesterday! The Youth Jury Prize was prepared by the Youth Jury from The Antoni Kenar Art Schools Complex in Zakopane. It is fantastic to obtain this recognition from a youth jury! With great joy we announce that ‘Samuel in the Clouds’ has won the ‘Grand Prix des Festivals – Conseil de la Vallée’ at the Cervino Cinemountain festival in Italy! 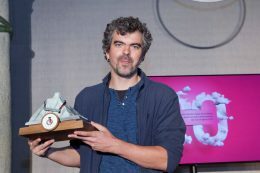 The film competed with 11 other winning films of a Grand Prix award at a Mountain Film Festival for the award for best mountain film of the year. The jury stated the following laudatory words about the film: “The jury considers this film as a major documentary work in terms of cinematic quality, and also recognizes the impact of this film for a reflection that we should all have on the subject of global warming. In a very subtle way, this film makes us live the evolution of nature and the disappearance of things (not only the glacier, but also of certain lifestyles, such as that of the protagonist). Congratulations to Pieter van Eecke and his crew for this incredible prize and recognition! ‘Samuel in the Clouds’ has officially been selected for the 20th edition of the Cervino Cinemountain Festival! The film will compete in the ‘Grand Prix des Festivals – Conseil de la Vallée’ section, in which only the winners of the Grand Prix Award in other festivals of the International Alliance for Mountain Film for the ‘Best mountain film of the year’ award. 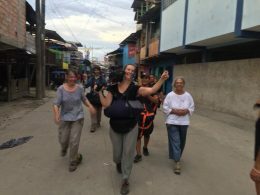 ‘Samuel in the Clouds’ has won the ‘Grand Prix du Festival’ at the Autrans Mountain Film Festival in France, as well as the ‘Genziana d’Oro for best mountaineering film at the Trento Film Festival in Italy. This festival takes place from the 5th until the 14th of August 2017. For screening dates and times, check out the screenings page.